"Should we be allowing Google to steal all our copyrights?" asked the News Corp. chief at a cable industry confab in Washington, D.C., Thursday. The answer, said Murdoch, should be, " 'Thanks, but no thanks.' "
and came across a quote about how SEO is some dark art, which kinda annoyed me. In the past I have posted examples of how media is often corrupted, but I figured another round wouldn't hurt. Have you been negative about some of Google's new products? They might blacklist your organization. Google Inc. has blacklisted all CNET reporters for a year, after the popular technology news website published personal information of one of Google's founders in a story about growing privacy concerns for the Internet search engine, according to a CNET statement. Have you generally been fairly positive in covering Google's new products? Google might accidentally land the mother of all linkbaits in your lap a day early. They were keen to promote early users of Google Checkout as well. After Google bought Youtube they heavily promoted the service directly in Google's organic search results via their "universal search" strategy. They also promote select news sites directly via "universal search" in spite of how many of those newspapers complaining about allegedly getting a raw deal. Google strategically undermines copyright, but not just in the way that guys like Rupert Murdock think. The way they *really* do it is through ranking whoever stole your content if you chose not to be indexed. Simply put, Google has partnered with virtually every online content thief (as needed) to force premium content providers to make their stuff available. Either you get credit for your work, or someone else does. Lyrics, poems, ringtones (that the user programs rather than downloads), quotes, and proverbs have no central authority. When you see pages with this content, you cannot judge it to have been copied, and the pages should not be assigned a Spam label. Unfortunately, some content is written specifically for Spam pages and you will not find it on another source. Although you may be convinced that the intent is to deceive, if the content makes sense and appears original, you will not be able to label such pages Spam. If you brand something and build up perceived value and demand for it Google will offer customers "solutions." Google further harms intellectual property holders by recommending search suggestions, and not cleansing the suggestions of illegal activities. 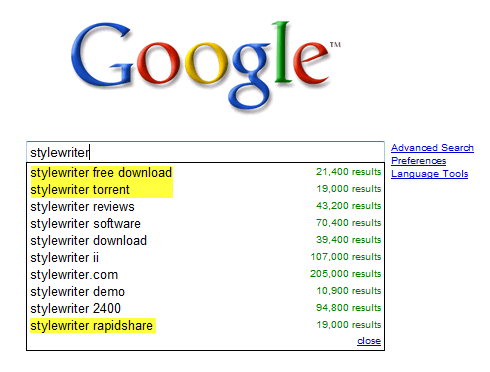 70% of the population doesn't care that much that 30% of the population is involved with music or software piracy, but when they conduct a Google search for "Stylewriter" and see that the some of the most popular searches for that software program are torrents then that adds social proof of value to the concept of stealing (and distributing) that copyright software. That forces publishers to offer a free trial download, or lose out on the opportunity to engage with many potential customers intercepted and misdirected by Google. Google's ad network is optimized to agnostically maximize earnings. Earnings are often optimized through the promotion of scams, fraud, and offers with hidden costs in them. Machines do an excellent job of maximizing earnings, in large part because machines have no morals. In spite of allegedly being handled a month ago, those scam ads (Google's words, not mine) are still on Google today! 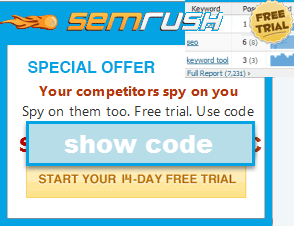 In spite of such scams in broad daylight, how often do you here of the dark arts of AdWords? If you look at their video game patents they want to go so far as understanding personality flaws and character weaknesses such that they can target ads against them. What might behavioral ads target at your flaws? How much could that cost you in your lifetime? In the following video Rupert Murdock mentions that he attempts to shape the news to promote some of his goal and promote things like the bogus war in Iraq. Such "free" media campaigns had a hidden cost of about a trillion dollars and thousands of lives. In spite of such scams in broad daylight, how often do you here of the dark arts of mainstream media? Have you looked at WebMD recently? Look at how the line between ads and content has vanished with custom "sponsored content" sections published on their site. If you didn't look closely you would think that this webmd.com/learning-manage-depression/ was editorial content. As many bad health practices as there are, it is quite scary to think of all the bad health practices still practiced, and how filtered public health information is. Shady pharmaceutical advertising is getting so bad that the FDA is warning about it. If the media is employing the tactics and seeing results then why are they still using that stupid dark arts lens to describe SEO? Even Forbes.com is selling text links to pass PageRank (example pictured below). Forbes has worked with at least 3 different SEO firms, has hosted many high profit doorway pages, blatantly violate search engine guidelines by selling links to drive PageRank, and yet they still call SEO "dark arts" as though it is some type of voodoo. How ignorant can a reporter be of why his job is going away and why their employer can not compete? If you were a reporter by trade, wouldn't there be a mite of curiosity that causes you to actually research what you are writing about, especially if it involved your own job security? What can we do to cure reporters of their SEO ignorance? Let's face it: 95% of the (relevant) work involves buying and exchanging links. All the other "hard work" of code rewriting, excellent content etc.. doesnt carry much weight in Google SERP's anyway. SEO ignorance is hardly limited to the media. I am amazed that I still have to explain what I do to people who might end up hiring me. But I do attribute it in most cases to people at least 35 or older (read: the decision makers)...simply because the learning curve on us oldies is greater because we didn't have computers as kids. Many who do not get SEO also struggle with the email. I'd say it's to our benefit for it to be thought of as a 'dark art' on computers. People are afraid of what they don't understand on computers. On that basis alone it will always be a dark art. But that's why people are willing to pay a premium for it, and I'd prefer the cash to a warm fuzzy feeling. The other thing is that people nowadays want what works. It's all about the bottom line, and no "kind of gray" stigma is going to keep them from wanting those profits. On a side note(about your comments on rebilling), I'll point out that the NYTimes and magazine publishers work off a very similar tactic(though many companies nowadays have crossed the line). The media has an amazing ability to critique everyone, and never reflect that inwards. Edit:Wanted to make it clear I'm not supporting grant offers or the companies doing the rebills nowadays, just pointing out the hypocrisy. Aaron you're right about the oddness of "...Google will offer customers 'solutions'." It's a bit ridiculous what shows up as suggested by Google in the "Searches related to". Check this is out, search for create computer on Google. You'll get "how to create computer virus". That is the sorta stuff that comes from a complete lack of editorial. The profit margins are higher, but so are the risks to society. One must ***really*** believe that human nature is inherently good to suggest people create crimes in the search results as a value added feature. Aaron, if you ever run for president, you get my vote. Thanks for sharing the information and teaching webmasters and SEOs what it's all about. I wish mainstream media wrote more about the true face of politicians, media, Google, and other corporations. and now it's TechCrunch calling SEO "a dark magic"